Another shiny new Clibu update has been released. The main new feature in V2.00.14 is the ability to access a Table of Contents for each Article, select an item and position to it. Articles can get quite long and finding what you want inside them can be more difficult than it should be. This is where the Table of Contents (TOC) is very, very useful. When you click/tap on the new TOC button the current article is scanned and all content that is formatted as headings is gathered and displayed in a drop down menu as shown here. Note that the numbers 1-10 in this example are in the actual article headings. Selecting a TOC item scrolls it into view and briefly highlights it, making moving around articles much quicker. Whilst editing the cursor is positioned at the end of the selected item. When you open Clibu it now restores the current Article to the last article you viewed in each Tab in the previous session. This is in addition to restoring and running the last query. So you start back exactly where you last left off. This is something I’ve personally been wanting for a while now. It is all about workflows and getting back in the zone as effortlessly as possible. Various issues with Clibu’s Annotations (pop up Notes) which crept into V2 have been fixed along with a few illusive, hard to track down and annoying bugs. See the complete Release Notes for details. which you can also access from the Clibu User Menu. This release brings back a few things we temporarily removed when moving from Clibu V1 to Version 2 . 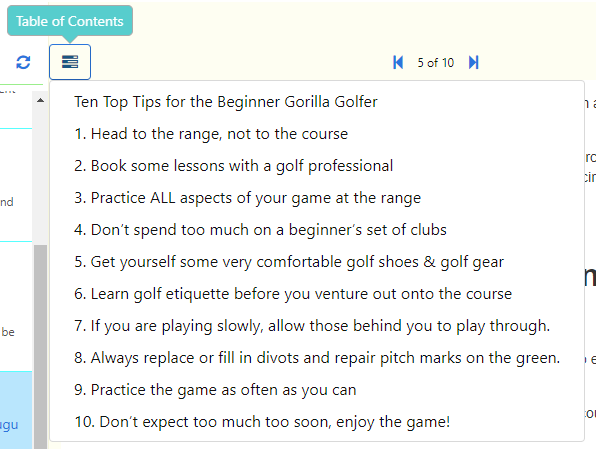 First of all the Quick Tour has been updated and rejigged to work on Smartphones and Tablets. And first time users prompted to start with the Tour. Next the ability to commence editing an article by clicking anywhere in an article is back, with a new option to enable it. The new Click in article to edit it option is enabled by default. The reason this was removed in V2 was it gets in the way on touch screen devices, which is why the new option works on devices with a mouse (Desktop PCs), but not with Smartphones and Tablets. 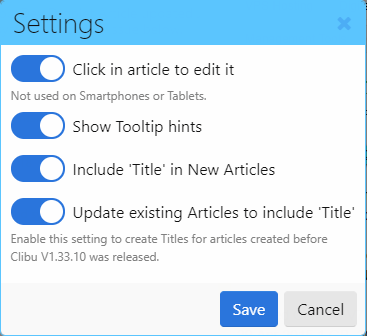 We’ve also updated aspects of the Clibu Web Clipper so that the “Append Clip to Article” Browser context menu item now always uses the current article in the current Tab instead of the last selected article, which was confusing. When “Append Clip to Article” is used and the current article is being edited, it is now taken out of edit mode so that the new content is appended correctly. Various other issues and improvements are outlined as always in the Clibu Release Notes which you can access from the Clibu User menu or this link.